When it comes to bars and breweries, the best options aren’t found only in big cities. In the small, Southwest Florida coastal towns of Punta Gorda and Port Charlotte, there are many places (well-known and unheard of) where you can wet your whistle and have a good time. Here are some of our favorite places for beer, wine and cocktails in Punta Gorda and Port Charlotte. The Orange House Wine Bar in Downtown Punta Gorda serves a unique selection of wines and tapas in a quaint atmosphere, mellowed out by the sounds of smooth jazz. For a hands-on experience, make and bottle your own wine at the Gilded Grape Winery or enjoy live music, trivia or karaoke in their wine bar with a glass of house-made wine. D’Vines Wine & Gift Emporium in Port Charlotte features a wine and coffee bar, wine-themed gift shop and wine tastings. Beer connoisseurs will love Punta Gorda’s two craft breweries. Fat Point Brewing brews flavorful signature beers, seasonal beers and interesting limited releases. Visit their laid back taproom for light eats, trivia, music and food trucks. Peace River Beer Company was designed to honor the local vibes from picnic tables to a river-themed bar top. They brew beers for every taste that pair well with food truck grub. Craving something outside the box? Said to have the coldest beer in town, the Cold River Saloon is a no-frills biker bar (and we don’t mean bicycles) on the outskirts of town with pool tables and weekend entertainment. Or hop aboard the Punta Gorda Brew Tours bus to comfortably tour all the bars that Charlotte County has to offer. Alligator Bay Distillers is the only craft rum distillery in Charlotte County and uses 100% Florida molasses in their rum, coining the term “Cane to Bottle.” Buy a bottle from their onsite gift shop and bring home a taste of Florida. 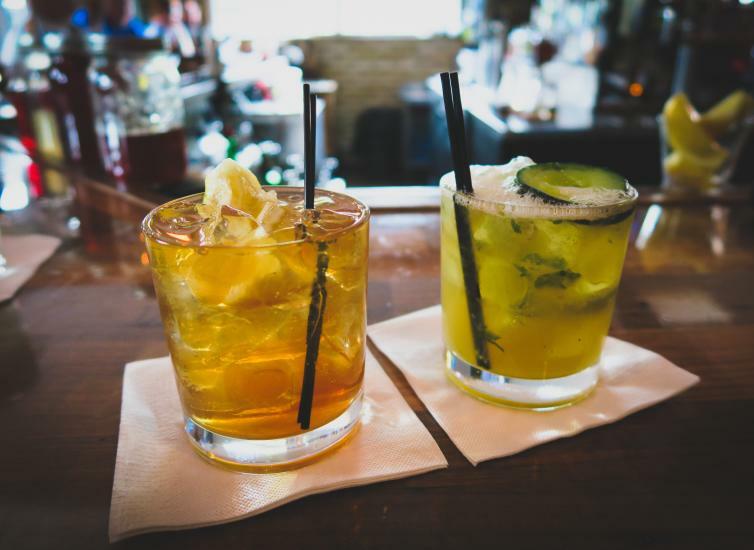 Whiskey-lovers belly up at Leroy’s Southern Kitchen and Bar for down-home cooking, handcrafted whiskey cocktails and cold local brews. The Blue Turtle has hand-crafted cocktails in a tavern atmosphere from martinis to mules to margaritas. The local spirits scene has many hidden gems that you may not know about! Check out our restaurant listings page for even more bars and restaurants.